Botox cosmetic injections are for the treatment of facial wrinkles, primarily between the eyebrows, forehead & crows feet. Botox is injected into targeted facial muscles to intentionally produce weakness or paralysis of those muscles. This results in the improvement of the lines and wrinkles that the targeted muscle action produced. The effect of Botox is not permanent and repeat injections are necessary to maintain its effect. Response to Botox is usually seen in 2-6 days after injection and usually lasts 3-4 months, but will vary from person to person. Follow up sessions may be required to achieve the desired result. 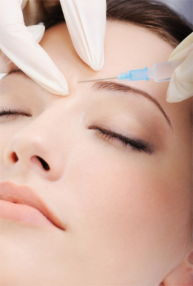 The amount of Botox needed varies, based on the strength of the muscle and the area treated.